"Masterful storytelling about gun ownership gone beserk. Compulsive, entertaining and sickening, Moore comes out with both barrels blazing! (pun intended)"
Using the tragedy of the shootings at Columbine High School in the United States as a stepping point, Michael Moore illustrates the American infatuation with weapons and the gun culture. It is concise, witty and ultimately sad to the point of almost tears. Interviews abound on this DVD, from the normal man on the street, through to the singer Marilyn Manson, whom some blame for the shootings at Columbine because of the inflammatory nature of his lyrics. Comparisons are done on the level of gun related homicides in the USA and around the world and the comparison is shocking, with the USA outnumbering every other country featured by many many thousand. Why do Americans like to kill each other so much? Despite his best efforts, Moore can only come back to the same reason; the nation is kept in a state of fear where it is easier to react with force than reason. Add to that paranoia the fact that you can go to a bank, open an account and they'll hand you a weapon your choice. Then you can go to the local K Mart and buy bullets over the counter with no ID required whatsoever. An interesting counterpoint to this tale is when Michael goes to Canada, a nation where gun ownership is just as high pro rata as the USA, however the homicide rate is virtually non existent by comparison. It's also great listening to the reasons why Canadians think that Americans are so prone to killing each other. Cut to extremely chilling video footage inside Columbine High School during the actual shootings and we see the kids running in terror and panic as the two killers casually walk among them, dispensing death and injury at their whim. Over the top of this is audio of emergency calls being made during the actual attack that bring home the sense of loss that these poor people had to suffer. A highlight for me is when two of the kids horribly injured by the Columbine shootings accompany Moore to K Mart headquarters as the shooters bought their bullets from a K Mart store. The irony is that they intended on getting a refund for those rounds! What actually occurs is something far greater and makes it worth the watch for that segment alone. Moore manages to corner NRA spokesman and esteemed actor Charlton Heston about why he thought it was a good reason to attend gun rallies in Columbine shortly after the tragedy that happened there. What follows is amazing as Heston, rather than being the elegant man that I'd always thought him to be, starts on about the homicide problem being connected to mixed races in America. 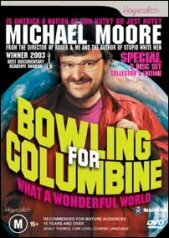 Bowling for Columbine scores a ten for it's subject matter and the way that Moore handles it with integrity and passion. It may not be the perfect documentary, however in a way it is if only for the simple fact that it is without doubt guaranteed to make you think about what you can do to make a difference. What you do next about it, is up to you. For some ideas, look around on the internet for lobby groups or even visit Moore's site (listed above). The disc is shown in 16:9 widescreen and it must be remembered that this is not a Hollywood blockbuster, far from it. Video ranges from clear to grainy when Moore is actually taping and then accesses archive footage. Everything works perfectly however and there is absolutely nothing to complain about in terms of visual quality. I reviewed this film using a 5.1 setup and whilst it's a documentary, it still uses the full surround nicely, although a bit spare on the subwoofer. For the most part during interviews and dialogue, we mainly hear audio through the centre speaker and nothing else is used except for when needed. I guess the easiest way to put it is that it's not used for the sake of having a full surround mix. There are two discs in this set and most of the extras are on the second disc. There are a whole swarm of extras on this set and getting through them all is nothing short of exhausting and surprisingly enough, there were a few areas that I was disappointed. For example, Mike doesn't do an audio commentary on the movie, he gets some of his workers to. Despite the fact that these folks are the lowest on the payroll, such as interns, assistants and even the receptionist, they do come out with some funny stuff, although you can't forget the whole time that these people really are nobodies and you'd rather hear Mike talking, even if he was in company with these kids. After that we get to see what happened when Moore won the Oscar and started talking about George Bush and the war in Iraq. The Academy wouldn't let him use the footage of his speech so he gives us a rundown on what he said and why he said it. It's interesting enough even though it's only Mike sitting on his outdoor setting with the Oscar. By this stage though, we've identified enough with Moore that it will captivate you. Possibly the thing that annoys me the most is that Moore only gives an audio intro to the DVD and you only see a picture of his face and hear the voice. He believes that the movie does the talking for him and this is the reason why he doesn't contribute to the commentary. We do get to see however Michael's return to the community of Columbine after the shooting and the release of the movie and excerpts of the speech that he gave there. It's good viewing although heavily edited for time. Add to that a swag of interviews and some music videos and you have a pretty comprehensive list of extras on this DVD, all of which are worth making your way through. Just be prepared to set aside a number of hours to get through them all. It's a great list of extras.